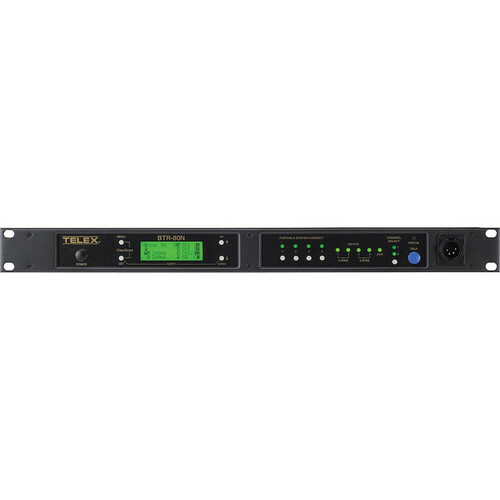 The Telex BTR-80N 2-Channel UHF Base Station (A4M Telex, H2: 500-518MHz Transmit/632-650MHz Receive) is a 2-channel, frequency-agile UHF wireless intercom base station with channel access from each of 4 full-duplex beltpacks, stage announce output with relay closure, wireless talk around (ISO), the patented Enhanced ClearScan channel search feature, and a talk/listen headset station at the base. The BTR-80N features a transparent graphical user interface and a backlit display, with advanced technology functions such as combination tone code/RF noise squelch and DSP digital audio processing. This unit has an A4M Telex headset jack and works on H2: 500-518MHz Transmit/632-650MHz Receive frequencies. Improved narrow band wireless delivers an unprecedented 25kHz of modulated band width, allowing more users per channel in the cramped UHF spectrum.